Join us for the annual Saukville Crossroads Rendezvous on May 17-19, 2019 at Peninsula Park in Saukville, Wisconsin. 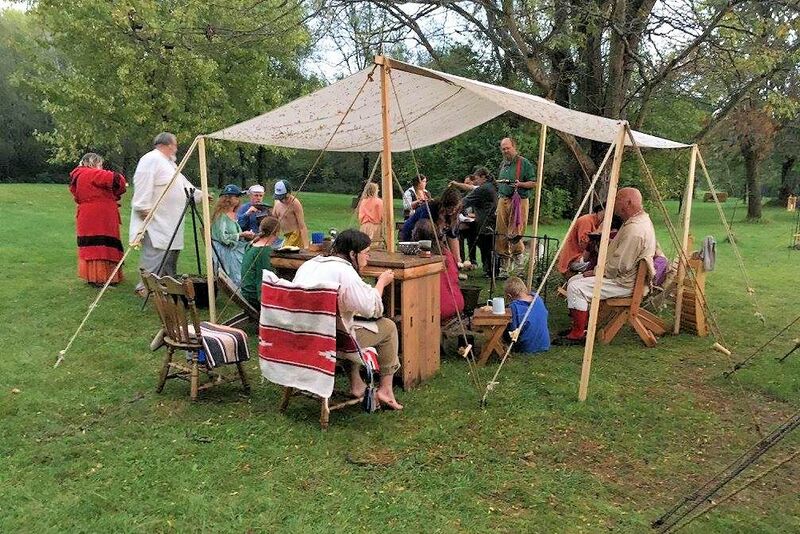 Saukville Crossroads Rendezvous is a historical reenactment, sponsored by the Saukville Historical Society and held the third weekend in May. The event focuses on Wisconsin’s Fur Trade Era, from 1750 to 1840, and visitors can expect to speak with and observe historical reenactors representing the various inhabitants of our State prior to statehood, including voyageurs; military groups representing the French and Indian War, the American Revolution, and the War of 1812; First Nations representatives and reenactors; and, tradespeople such as blacksmiths, tinsmiths, weavers, and more. 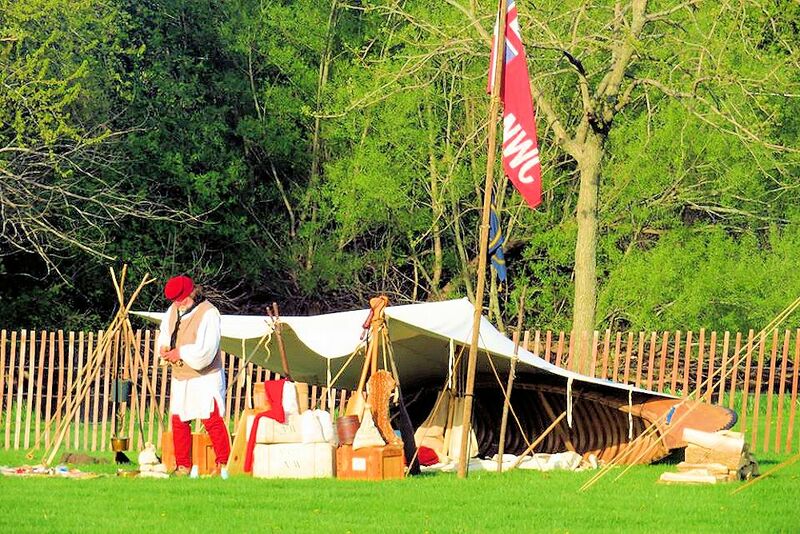 Step out of the 21st century for the day and enjoy the sights and sounds of mid-eighteenth to early nineteenth century Wisconsin at the Saukville Crossroads Rendezvous! Friday School Day 9:00 a.m. – 2:00 p.m. There is no parking at Peninsula Park, and close street parking is very limited. On Saturday and Sunday, visitors are encouraged to park at U-Haul Moving & Storage, located at 835 E. Green Bay Ave. in the former Piggly Wiggly store, and take the free shuttle to and from the park. On Friday, from 9 a.m. – 2 p.m., the Saukville Crossroads Rendezvous offers a School Day, designed specifically for area school children to experience history firsthand. This experience is primarily geared towards students in 4th through 8th grade, but is open to all ages, as well as home schooling groups. The cost is $3/child (home schooling groups may enter at the $5/adult and $2/child rate). Schools who wish to participate in the School Day must register. Fill out the online form and we will send out your information packet. We are looking to work with local Civic and Non-Profit groups to provide food, beverages, and services at the event, but individuals are welcome, as well. Historical attire will be required and facilitated, and booth space will be provided to nonprofits. This is an excellent fundraising or service opportunity. If you are interested, please contact us! In the fall of 2017, Mary Boyle and Sara Dahmen, two historical reenactors from Port Washington, decided it was time to bring the Crossroads Rendezvous back. Together, with their families and the Saukville Historical Society, they are excited to introduce a new generation of visitors to the magic of living history and the important part “the crossroads” of Saukville played in the history of our community, State, and Country. Join us at the Crossroads this May! The Saukville Crossroads Rendezvous is presented by the Saukville Historical Society, a 501 (c) (3) organization affiliated with the State Historical Society of Wisconsin. Please direct any questions or concerns regarding the event to the organizers at info@crossroadsrendezvous.org, or fill out the form below. Mark your calendar today so you don’t miss the next Saukville Crossroads Rendezvous on the third weekend of May at Peninsula Park in Saukville, Wisconsin.